Angel's Watch is a lovely and spacious cedar home with eight bedrooms and six bathrooms. 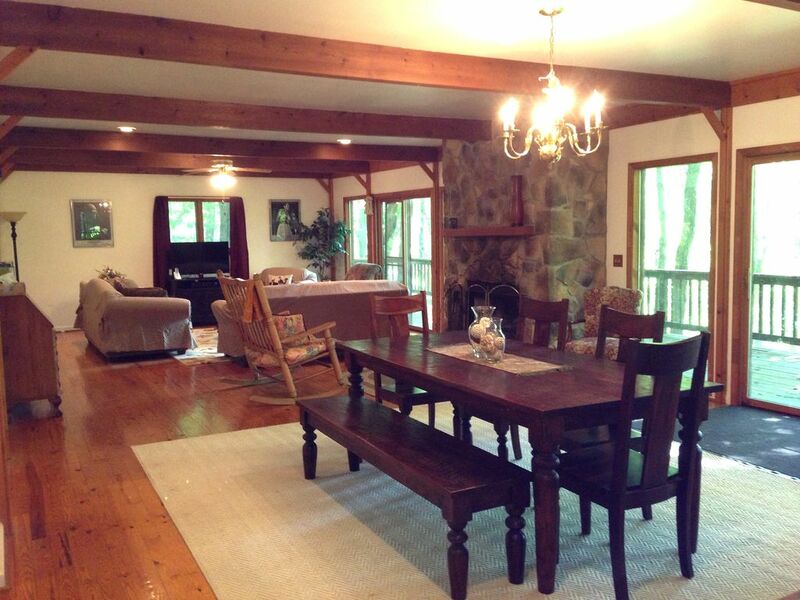 We are located in a wooded setting with tremendous scenic views. The floor plan allows for plenty of room to enjoy gathering with friends and family, but still have your own space. Charming wood floors, attractive gourmet kitchen, sunny great room, and a gorgeous stone fireplace. For those in your group that want to stay 'connected' we offer satellite television and wireless internet service. From June through August, splash in the community pool and hot tub just across the road. A fantastic friends’ getaway or a family reunion (invite the cousins, too!). Along with the scenery and relaxing atmosphere you can enjoy activities like great shopping, outdoor adventures and small town festivals and events. Pet friendly, with an additional surcharge. Berkeley Springs: Berkeley Springs is one of the best known arts towns in the Mid-Atlantic. Many practitioners of both the healing arts and visual arts have been attracted to the area for several centuries. It is a town of galleries, good food and a variety of 'alternative' and holistic therapists. Coolfont is a quiet, rustic retreat just a couple of miles outside of Berkeley Springs--the roads and cottages were designed in complete harmony with the landscape, maximizing both beauty and privacy. Cacapon State Park abuts the property and features a Robert Trent Jones golf course, fishing, and hiking. We have large outdoor tables that can be brought in for a larger indoor seating area. We have stayed here on seven occasions and are very happy with the bedrooms, bathrooms, kitchen, cable, heating system, linens and appliances. Great coffee maker. The deck, porch and common areas are well set up and its a short walk to the new brewpub in Coolfont. Thanks. Excellent choice for a large group. The view out the back of this house is lovely. And Berkely Springs is an easy drive from Pittsburgh and Washington/ Baltimore. The fridge might be a little small if you have every bedroom occupied and are cooking 3 meals a day. Everything was clean, but it seemed like no one had paid attention to details in awhile. Many light bulbs and batteries need to be replaced. Furnishings are a bit worn. This cabin is an excellent facility for a large family group with its eight bedrooms and six bathrooms. The cabin is well furnished in every aspect and nicely situated. The house manager is especially helpful and responsive. Even in the winter when the recreational facilities are not available, it provides a very pleasant environment for a family holiday gathering. Property is well maintained. All the recent rain caused parking area to more mud than gravel so a litlle unpleasant getting in and out of house. I will have to say I was hesitant about staying in a cabin so far away from home. Last year, we rented a different Cabin in VA and it was HORRIBLE. Once I talked to the owner, she assured me that my experience would be different. There was heat, it was neat, cozy and accommodated all of our needs. We are definitely coming back. Enjoy over 3500 square feet of living space in the quiet woods of the award winning Coolfont Mountainside community. Amazing wooded views from the deck and screened porch! Community amenities include swimming pool (seasonal), kiddie pool, hot tub, tennis courts, and basketball courts. Five miles from golf, swimming, boating, fishing, horseback riding, hiking, kayaking, and canoeing. Some of the best fly fishing in the East! Eight miles to town for mineral baths, spa, shopping, and dining. Ten miles to C & O Canal Bike Rail Trail along the Potomac River; also available for boating. Downhill winter skiing is available about 40 minutes away. Hunting is in season. Walk to creeks.